Marking the last day of the year with a 10.5 hr walk in constantly drizzling rain doesn’t sound like much fun, does it? It wasn’t exactly the plan, but it was the reality! Graham and I had another four days to get fit with, but the weather was almost just as bad as the last four. We thought we might be able to get away with ducking into New Pelion and timing Oakleigh, Pelion East and Proteus for in between the fronts. Unfortunately the weather forecast left a lot to be desired, and the day we walked in (after a second 14hr night shift with next to no sleep) was the only day without near constant rain! But this write up is just about Proteus, which we did on our third day, or the last day of 2017! We set out a tad later than planned, by 8:45. We ran into Shelly, now parks ranger, who we’d first met at Lake Curly. She was looking good and very happy and it was nice to say a brief hello! In a quick 2 hrs we were at Pine Forest Moor, just before the start of the forest. We looked out across the button grass moor into the whiteout – it gave nothing away. So we set off on a rough bearing, trying to make sense of the ridges as they materialised in the mist so we had a visual bearing as much as rough line of the gps. 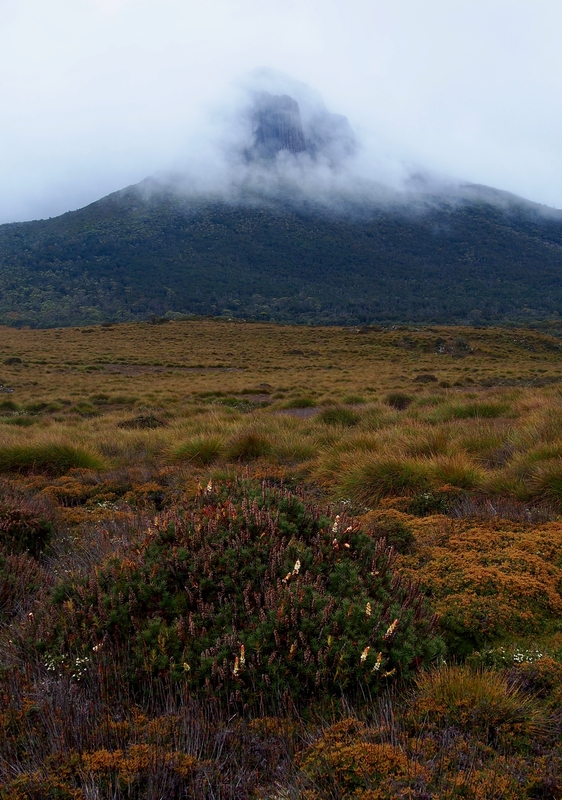 Leaving the Overland Track, we’re heading for that thing over there in the mist.. I think! The going was slow, as we wove in between button grass mounds, trying to stick to the grassy or coral fern patches. We quickly tired, and gave in to the fact we weren’t going to be breaking and speed records. On the southern side of the first rise we spotted the ?little weather station that Shelly had told us to check out. She wasn’t sure what it was, and neither were we, but a weather station certainly seemed plausible! The going improved even though the weather didn’t and by about the second rise there was much less button grass. In patches we strode through low scrub, but nothing that slowed us down anywhere as much as the button grass had. Lemon scented boronia predominated higher up, and mountain rocket and flag irises made an appearance too. As we crushed the boronia underfoot we inadvertently released quite a nice smell in our wake! As the ridge curved around and we approached the main climb, we attempted to stay on the northern side as per the notes in the Abels. As we were to discover on the return trip, there’s a very decent pad that runs along the southern edge! 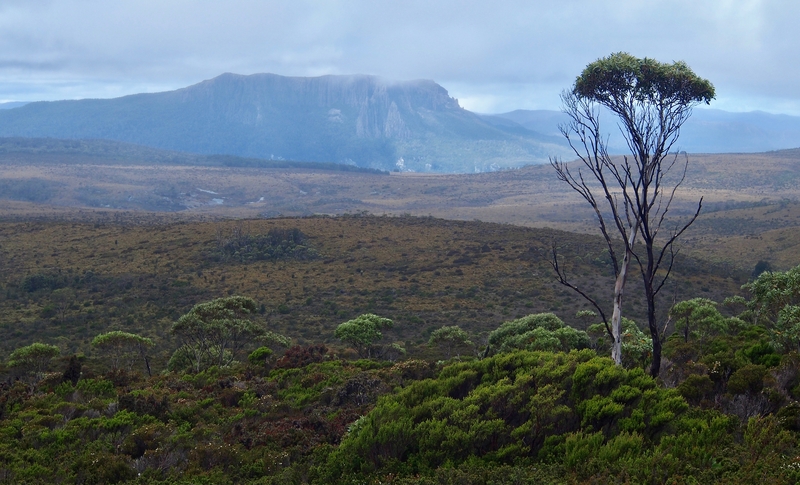 We reached the summit somewhere around 2.5 hrs after leaving the Overland Track. We expected to find the summit cairn, it had been described in the Abels, but found it quite puzzling as we couldn’t figure out where the rocks had come from – there weren’t any others in sight!! 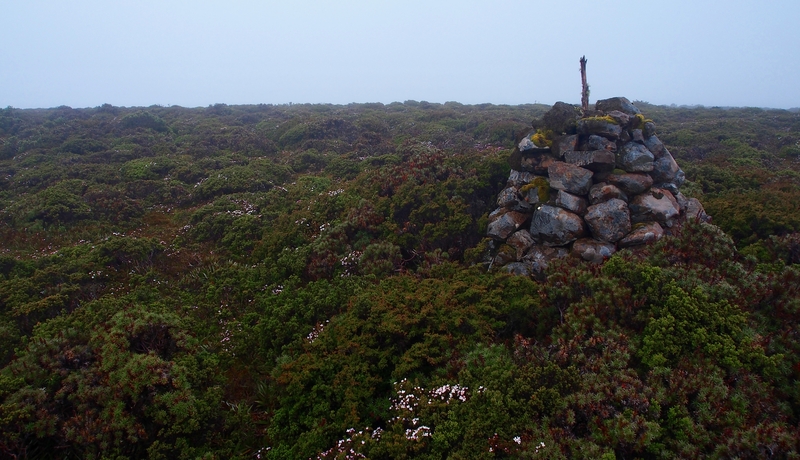 Summit cairn of Mt Proteus – yay!! It was white, wet and cold, so we didn’t stay very long before beginning a much slower plod back down. We did, however, catch glimpses of Pelion West and Oakleigh as we lost a bit of height. It would have been speccy to see them on a clear sunny day! Glimpse of Oakleigh as we make our way down, you can see the rough route, we’re headed to the tiny clump of trees just above centre of the photo and below the craggy bit of Oakleigh – that’s where we left the OT. We sheltered behind a shrub for lunch somewhere on the moor but the fuel did little for our energy levels. An hour later we were happy to be back on a formed track, and even happier, 2 and a bit hours later, to walk into camp. 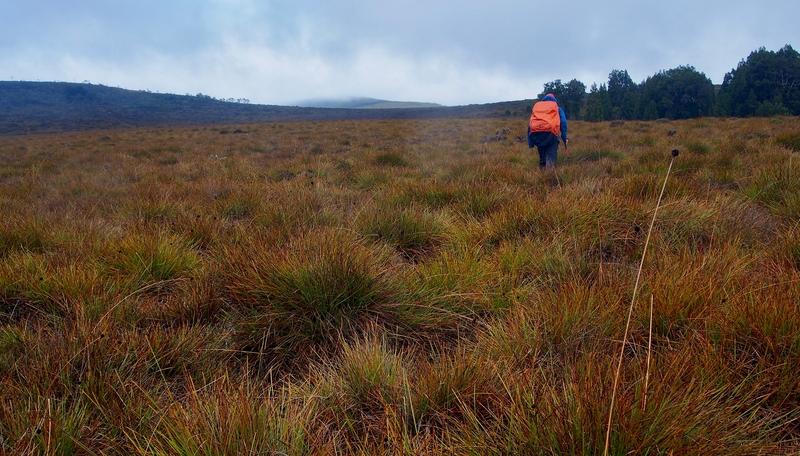 Approaching the clump of trees that marks the Overland Track and the final leg of the day – we’re looking forward to getting OFF the button grass! We celebrated with soup, lentils (yummier than that sounds) and lollies ;)! Hi Becca. David Tongs and I summited Proteus on the 4th of January, 2013 when it was 42 degrees in Hobart and Dunalley was alight. It was 37 at Pelion and a cloudless day. Out on the buttongrass plains it was fantastically hot. We had lots of fuel and water. Also we were staying at Windermere Hut (we knew the Ranger) so we didn’t walk that far. I remember walking back along the OT from Pine Forest in 35 degree heat at 9:45pm with the stars emerging. Bliss. Sounds like quite the opposite extreme!! Would you believe we’re both sporting sun pinked cheeks despite being in rain jackets and overpants for almost all our walking?! 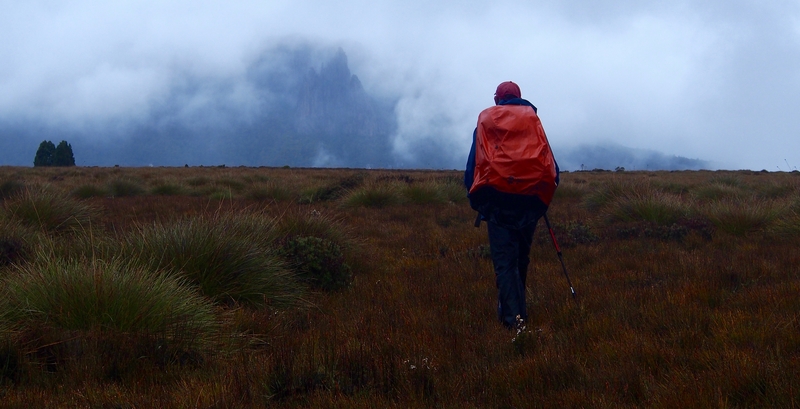 Hmm, stars, warm nights and the Overland Track – brings back a few memories. Some of the best walking conditions hey?? !